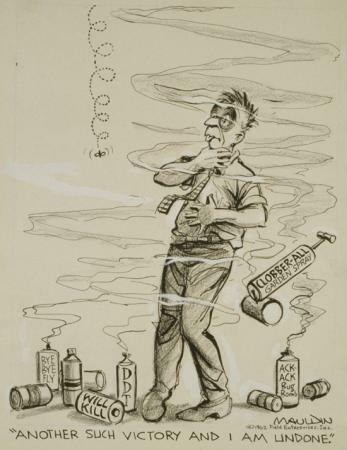 Bill Mauldin captured the essence of Carson’s argument in this Chicago Sun-Times cartoon of 1 September 1962. Used with permission © 1962 by Bill Mauldin. Courtesy of Bill Mauldin Estate LLC. A huge American best seller and October selection of the influential Book-of-the-Month Club, Silent Spring was famous even to those who never read it. The photo story in Life magazine made Rachel Carson’s face familiar to the wider public. Although Carson jealously guarded her privacy, she had become a celebrity against her will. Silent Spring entered popular culture and its argument filtered into popular consciousness. Popular Science published an article in June 1963 on “How to Poison Bugs … but NOT Yourself.” Another article, “And Was It a Silent Spring?” in the June 1963 issue of Popular Mechanics, investigated one of the instances of pesticide poisoning that Carson reported, in the Sheldon-Donovan area of Illinois, and confirmed her account with horrifying new details. 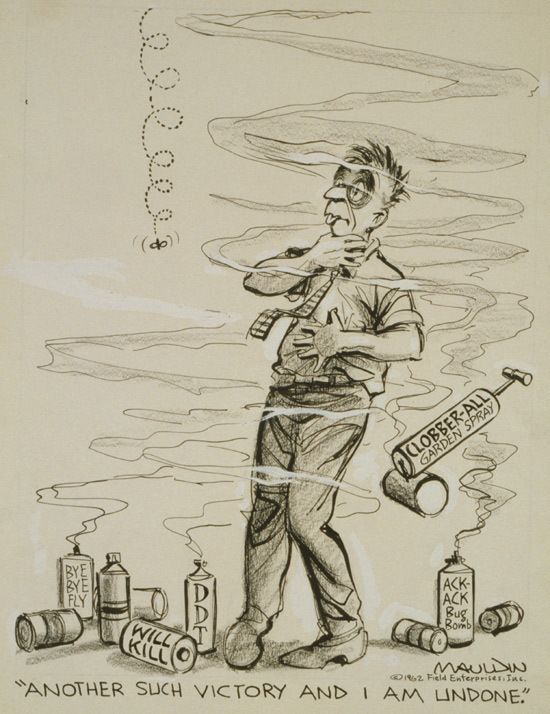 Dozens of cartoons appeared in magazines and editorial pages across the nation. Bill Mauldin, a beloved editorial cartoonist for the Chicago Sun-Times, drew on Pyrrhus’s famous remark about his costly military victory against the Romans (the first “Pyrrhic victory”). Two magazines famed for cartoons, the New Yorker and the British Punch, printed several about Carson or Silent Spring. In a sure sign she had become a cultural icon, Carson appeared in the comics pages of newspapers. In 1962 and 1963 Charles Schulz referred to her in four different daily strips in his hugely popular Peanuts comic strip. Perhaps to avoid controversial issues, they alluded to Carson’s sea books instead of Silent Spring, but they leave no doubt that Schulz admired her. 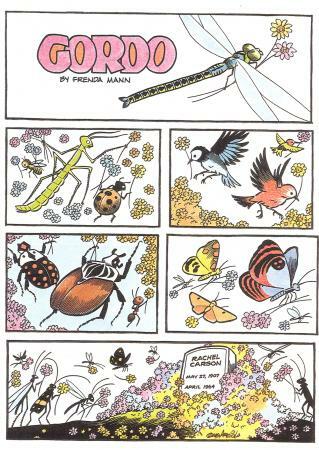 Gus Arriola’s Gordo, the first major comic strip with Mexican characters, honored Carson twice, with a daily strip on 11 April 1970 near the sixth anniversary of her death and a Sunday version for her 77th birthday, 27 May 1984. 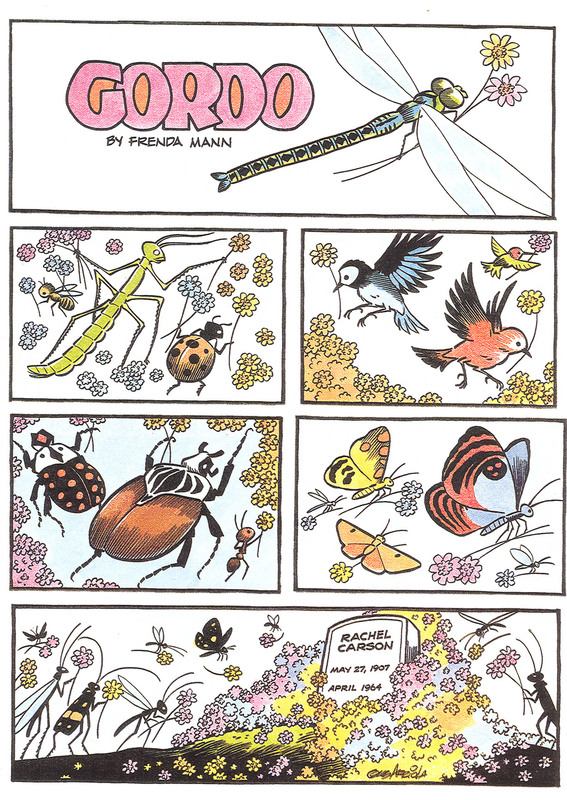 Gus Arriola paid tribute to Carson in 1970 on the anniversary of her death, and then to memorialize her birthday reworked the daily into a Sunday strip in 1984. © 1984 Gus Arriola. Courtesy of the Bancroft Library. Gus Arriola strip (11 April 1970) © 1970 Gus Arriola. Courtesy of the Bancroft Library. 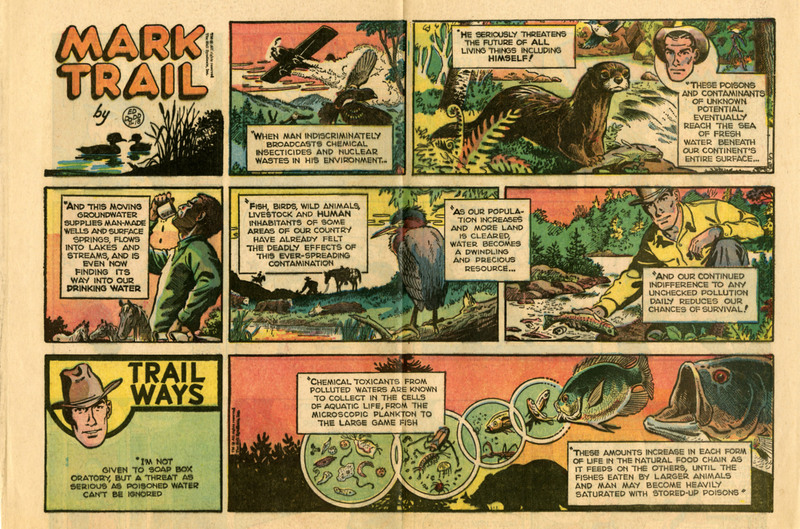 Ed Dodd’s Mark Trail, a comic strip about a forest ranger that wove conservation themes into its storylines, used its Sunday strips to educate the public about bio-concentration of chemicals in fish and game, as well as other issues that Silent Spring publicized. As the character Mark Trail states in this Sunday strip from around 1963, the strip conservatively avoided controversial issues and stuck to traditional values of conservation, but here artist Ed Dodd discusses the way pollutants concentrate as they work their way up the food chain to human consumers. © 1962 Ed Dodd. Courtesy of King Features Syndicate/ Distr. Bulls..
Carson and Silent Spring have inspired or appeared in much popular music. Surely the best-known musical reference to Carson is in the hit song “Big Yellow Taxi,” from singer-songwriter Joni Mitchell’s 1969 album Ladies of the Canyon. Mitchell sang, “Hey, farmer, farmer / Put away that DDT now / Give me spots on my apples / But leave me the bird and the bees / Please!” Counting Crows’ version of “Big Yellow Taxi” made it a hit song for a new generation in 2002. Recently politically minded songwriters have honored Carson and her book. In 2004, Emma’s Revolution, a politically radical duo singing protest songs in the tradition of Pete Seeger, released One × 1,000,000 = Change, with “Silent Spring,” in homage to Carson. Blackbird Raum, a green anarchist band from Santa Cruz, California, has also written and performed “Silent Spring.” Bolivian popular rock singer Grillo Villegas sings “Primavera Silenciosa,” mourning ecological destruction and demanding, “La primavera silenciosa / debe volver a cantar” (the silent spring / must sing again). The song appeared on the 2006 compilation album Contigo Avanzar. Jazz musicians have frequently honored Silent Spring. On her 1963 issue-oriented album Here’s Lena—Now!, jazz great Lena Horne sang, “Not a leaf is heard to murmur / Not a bird is heard to sing,” in “Silent Spring,” written for her by E. Y. Harburg and Harold Arlen. Jazz singer Carmen McRae recorded Allan Paul Shatkin’s angrier “Silent Spring” in 1971. In 1999, Belgian composer Nathalie Loriers’s jazz trio released an album entitled Silent Spring. Ninety-year-old jazz pianist and environmentalist Marian McPartland performed her composition “A Portrait of Rachel Carson” in 2007 with the University of South Carolina Symphony Orchestra under Donald Portnoy.